Most of the LNG imports this winter came from Trinidad. One or two came from Russia (with love). This situation of importing LNG to New England when the prolific Marcellus is just a few hundred miles away but can’t flow more gas because pipeline projects are being blocked, is an ongoing obscenity. This should not be happening. Not in America, land of the FREE and home of the brave. The U.S. Energy Information Administration published a post yesterday describing how LNG imports saved the day and kept New England’s natgas prices in check this past winter. During winter 2018–19, timely natural gas supply provided by imports of liquefied natural gas (LNG) at major regasification facilities serving New England played an important role in moderating natural gas prices in the region. The chart below shows that deliveries from regional LNG regasification facilities or sendout (the brown line) generally increased, especially during peak demand periods in January and February, in response to spot natural gas prices (the blue line) at the Algonquin Citygate, a widely referenced trading hub and benchmark for natural gas prices in New England. 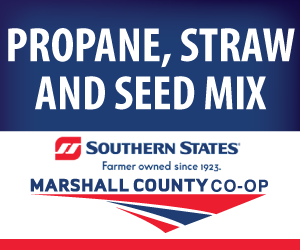 Sources: U. S. Energy Information Administration based on Natural Gas Intelligence and Genscape. Note: Includes daily natural gas sendout from Everett LNG, TGP Distrigas receipt, Northeast Gateway, and Canaport. Historically, spot natural gas prices in New England are more volatile during winter months when cold weather contributes to rising regional natural gas demand and more congestion on the natural gas pipeline network. 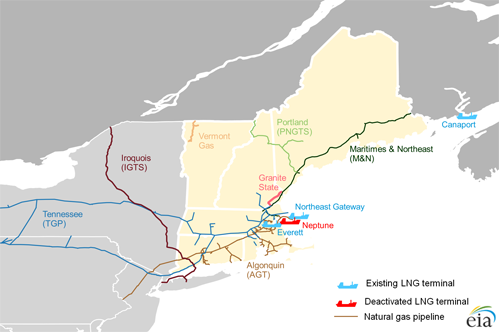 LNG becomes a key marginal source of natural gas supply when the pipeline network fills up because New England does not have underground natural gas storage infrastructure and is not a natural gas-producing region. 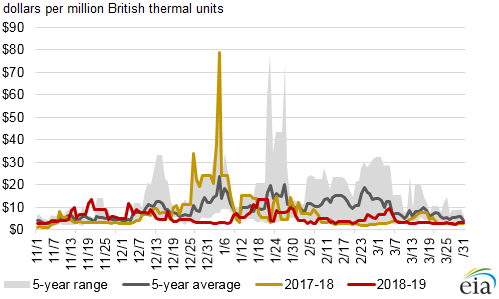 In January 2018, spot natural gas prices at Algonquin Citygate rose to $78.98 per million British thermal units (MMBtu) as the weather became extremely cold during the first week of January. During the winter of 2018–19, however, the timing of additional incremental natural gas supply provided by LNG imports played an important role in moderating extreme price volatility. 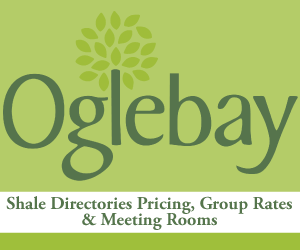 Despite periods of similarly cold weather, prices at Algonquin Citygate peaked at $13.56/MMBtu and averaged about $7/MMBtu in January and February, compared with $12.70/MMBtu on average for these months in 2014–2018. The Canaport LNG onshore terminal (1.0 Bcf/d capacity) at the port of Saint John in New Brunswick, Canada. Canaport LNG imports are transported to New England on the Maritimes & Northeast Pipeline. A fourth terminal—the offshore Neptune LNG facility (0.4 Bcf/d capacity), located 20 miles offshore from Boston and served by a Floating Storage and Regasification Unit (FSRU)—was placed in service in 2010, but it was later decommissioned because of low utilization. While in operation, the terminal received only two cargoes, in March and August 2010. This winter, in addition to 7 regular seasonal LNG shipments received by the Everett terminal (two cargoes in December, three in January, and two in February), Northeast Gateway also received two cargoes, on January 1 and January 29, 2019, according to the U.S. Department of Energy’s LNG imports data. These cargoes were the first LNG cargoes received by the Northeast Gateway since February 2016. Natural gas sendout from the Northeast Gateway contributed about 0.5 Bcf/d of additional natural gas on the days of peak demand in mid- and late-January when prices at Algonquin Citygate were the highest, at $13.56/MMBtu on January 18–21 and $10.04/MMBtu on January 29. The combined sendout from the Northeast Gateway and Everett terminals averaged 0.58 Bcf/d on January 20–22, 0.72 Bcf/d on January 30–31, and reached an all-time record of 0.83 Bcf/d on February 1, effectively moderating daily price increases by sending more natural gas supply to the New England market. In comparison, December 2017 through February 2018 peak sendout from the Everett terminal was 0.31 Bcf/d, or 0.5 Bcf/d lower than in the same period in 2019. 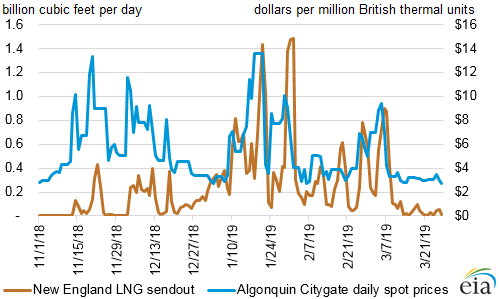 Canaport terminal in Canada also contributed to meeting peak demand in New England this winter by increasing LNG sendout on the days of the highest spot prices at Algonquin Citygate. 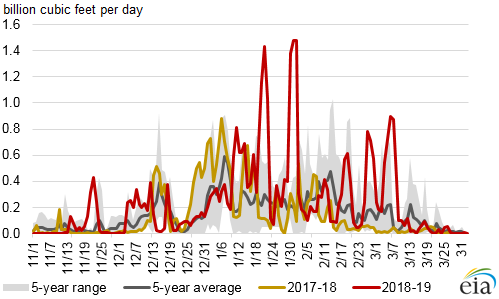 The sendout at the terminal averaged 0.69 Bcf/d on January 20–21 and 0.77 Bcf/d in late-January 2019, compared with 0.59 Bcf/d peak sendout during the winter months of 2017–18. 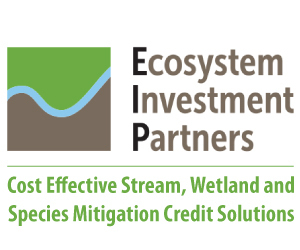 Source: U. S. Energy Information Administration based on Genscape.